North Carolina Board of Dentistry Wants To Hear From You.... really? The North Carolina State Board of Dental Examiners is holding a public hearing at it's office at 507 Airport Blvd, Ste 105, Morrisville, North Carolina. The meeting will take place this Thursday, June 17, at 7 PM. Written comment from the public will be accepted through August 8, 2010 and can be sent to the board at the address above. They don't seem to offer an email address. Association," "P.A. ", "Professional Corporation," or "P.C." for professional corporations and "Professional Limited Liability Company", or "P.L.L.C." for professional limited liability companies. All names shall also contain only the name or surname of one or more of the shareholders or members and may include the word "Associate(s)." the words “Associate(s)”, “D.D.S,.” “D.M.D.” and the geographic location of the company, provided that the company name may not be false, deceptive or misleading. Amended Eff. August 1, 2010; August 1, 2009; August 1, 2002; April 1, 1994; May 1, 1989. SMALL SMILES DENTAL CENTER OF COLUMBUS, LLC - JODI KUHN, DDS AND OLIVIA CROOM, DDS with a Trade Name of Small Smiles Dental Centers of Columbus. You pick the city then add the two names and file a DBA (doing business as) or a Trade Name, as it's called in some states and you still don't have a clue who your dentist is, who is going to treat you, or whose name will end up on the billing. This is EXTREMELY misleading. Why, well because Olivia Croom, DDS is listed on various dental plan sites as working in Farmington, MI, Mishawak, IN, and Dayton, OH. In fact her name didn't even show up of state corporate filings until February, 2010, just four months ago. Until then it was Jodi Kuhn and Patricia Nicklas, DDS and before that it was Kenneth Knott and Robert Andrus, and they NEVER treated one patient in OHIO. 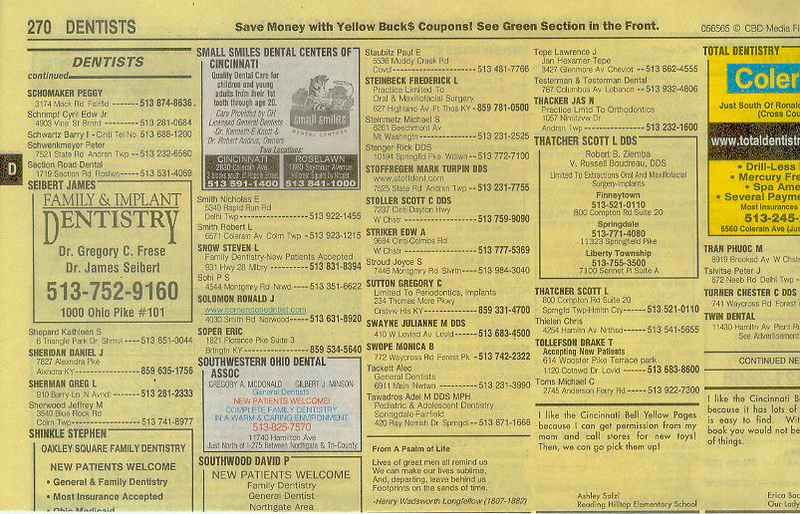 Here you can see when it was SSDC of C, LLC Kenneth Knott and Robert Andrus the phone book ad looked as though you would be making an appointment with either of the above dentists, but you would be dead wrong! By the way, these clinics have changed their legal name 4 times in 6 years. Let's look at the clinics in North Carolina that Michael DeRose and Tish Ballance owned and operated under the name Medicaid Dental Centers then changed it's name to Smile Starters. Everyone thinks good ole Michael Anthony DeRose was ran out of North Carolina on a rail, well they too would be wrong. He's alive and active in North Carolina. As recently as September last year (2009) he changed the name of one of the companies. (yes, I said one) He changed Michael Anthony DeRose, DDS, PA to Michael Anthony DeRose, Inc. (I suppose the DDS had to go after Colorado finally got off their asses and revoked his licenses). HOWEVER, on October 6, 2009, the North Carolina Department of Revenue had other ideas for Michael Anthony DeRose, INC. and put the business was on suspension for violating N.C.G.S. 105-230 (a). (he owes them money). The suspension notices mentioned that once this was corrected they would remove the suspension. It's hard to tell, but I believe everything was set straight with the Department of Revenue since it's status is Current-Active-Multiple. Ballance & DeRose, DDS, PA's Professional Service is -Dental Services. So under the proposed change to North Carolina's rules, what would Mike, Tish and Robert do? Well, the name contains the name or surname of one or more of the shareholders or members, it's a PA (professional association), so they are good there. Since they are allowed to use "Associates" or "DDS" or DMD" in the name, that would be ok too, Tish Ballance is still licensed but they could always drop that and use Associates. The only issue then is the location. Well, all they have to do is add "of Charlotte" or "of Asheville" or "of Fayetteville" or "of Winston-Salem" or "of Greensboro" or "of Raleigh". Then file the DBA as they do in Ohio and you still get Smile Starters and it clears nothing up and is still misleading. If they are worried about something being 'misleading' they should look at the decor and advertising these places do that makes parents feel they are seeing pediatric dentists when they are in fact seeing someone who doesn't deserve to be called a dentist at all! I know some are going to scream, oh no, Dr. Rafael Rivera, Jr. owns these clinics, and I say Bull! He's just started his own PLLC (Professional Limited Liability Company) and contacts his services to these clinics...or something close to that. Root Dental Management is also alive, current and active in North Carolina, address is still the Executive St address in Charlotte. Ryan P. Root filed his annual report in March 2010, wonder if Roger Walters is still on board there? Ryan P. Root's address on the annual report is PO Box 816, PUEBLO, COLORADO. I don't see what the point is to add the geographic location of each clinic, if it doesn't matter whether the dentist who provide the services there are not necessarily on the ones on the state corporate filings, heck they may well not even live in the state! C'mon North Carolina Board of Dentistry, you can do better, children are being abused, medicaid is being defrauded and children are dying.